The average person drinking a glass of orange juice would never realize it, but the navel orange has an amazing and unique history. Understanding the history of navel oranges requires an understanding of the botanical origins of all citrus. The history begins in Brazil and ends up with navel oranges as one of the most popular citrus varieties that are exported all over the world. Navel oranges were never an individual species of citrus. They are a “bud-sport,” or a mutated bud from a sweet orange that then grew into a branch with fruit of its own. 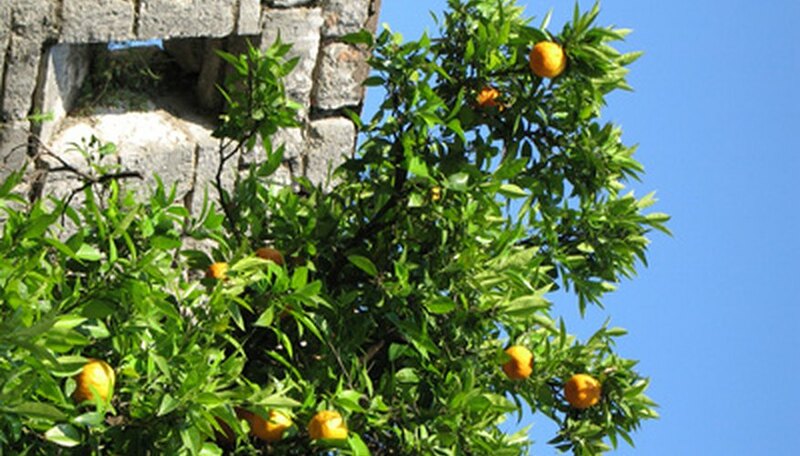 The sweet orange itself was also a bud-sport from two other citrus species, the pomelo (citrus maxima) and a tangerine (citrus reticulate), KillerPlants.com reports. The navel got its name from the bottom of the orange itself, which looks like a bellybutton, or navel. The navel orange bud-sport mutation happened in a sweet orange vineyard in Brazil in 1820. The U.S. Department of Agriculture then acquired some of the seedlings from Brazil in 1872. In 1873, Eliza Tibbets, a grower in Riverside, California, obtained one seedling from the government and the Riverside navel orange tree produced its first fruit in 1878, according to Paradise Citrus. Other citrus varieties had been brought to American by Christopher Columbus and some say that Ponce de Leon planted the first trees in the middle 1500s near St. Augustine, Florida, according to FloridaJuice.com. Soon after Eliza Tibbets acquired the first navel orange in California, other growers began producing them as well. In a few short years, what has become known as “the other California Gold Rush” began and close to half a million orange trees covered fields in California, according to Paradise Citrus. The sweetness and juiciness of the navel orange quickly propelled it to become a leader in the orange industry. Navel oranges continue to be one of the world’s most popular varieties, second only to Valencia, the orange-juice orange, which is even more widely planted. Navel orange production is strong in Arizona, California and Florida. There are other varieties of navel oranges as well, such as a dwarf Washington, summernavel (also a dwarf) and trovita, which ripens in early spring and requires less heat than other varieties, according to the "Sunset Western Garden Book." Navel oranges are seedless and therefore can’t reproduce through the normal pollination process. A new navel orange begins as a bud from a navel orange that is grafted onto another citrus plant. This reproduction process could be called cloning, as navels today have the exact genetic components as the first navel orange from the vineyard in Brazil. killerplants.com: What is a Naval Orange?